The unique design will provide you with an ability to flush sanding to the corner of the wall with a nose and the side of your sander. Though mainly used for working with the grain, the device does an exceptional job working across the grain to flatten it before working with the grain to leave a clean, even finish. Although this is one of the quietest belt sanders on the market, some may still find it to be rather noisy. 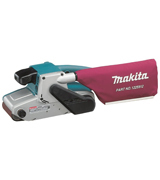 While being far from the cheapest option on the market, the Makita 9404/2 240V Belt Sander is well worth its price, given that what we have on our hands is probably the most versatile model that is equipped with the kind of power and utility that can handle any type of surface quickly and efficiently. The model's controlled finishing system eliminates the start-up scratching by keeping the sanding pad at a controlled speed. 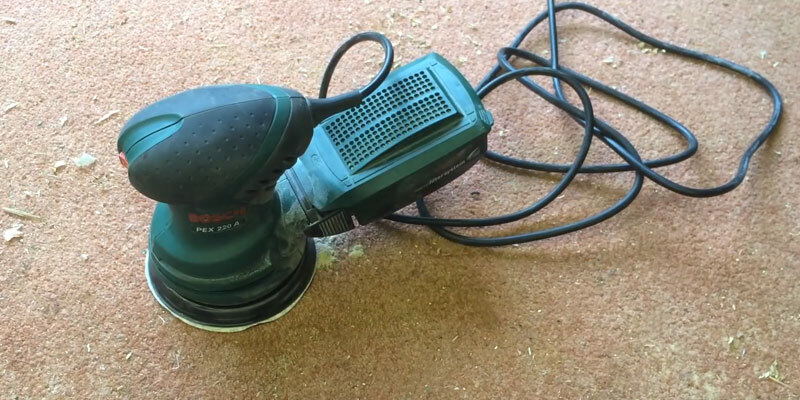 By having an integral dust collection, this orbital sander is capable of producing a much safer working environment, not to mention the fact that it helps to extend the sandpaper life. Some users remarked that the trigger button is not particularly comfortable. 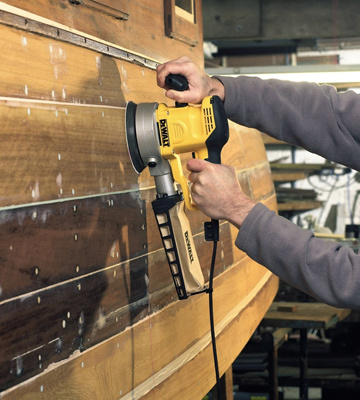 If you're looking for a random orbital sander that fits your hand perfectly and is capable of delivering fine finishes as well as dealing with fast material removal, the DeWalt D26410 should prove to be a perfect addition to your power tool collection. The telescopic design of this sander extends it to almost 2 metres in length. The model is equipped with a 0 - 90˚ pivoting head that will ensure the ability to follow the contours of any work surface, even if your wall is rugged and uneven. Thanks to the LED lighting, you will be able to see any shadows created by unsmooth areas. The device may seem a bit heavy to those customers that aren't used to drywall sanders. If the walls that you generally deal with tend to be uneven, rough, or bumpy, and you often struggle trying to deliver a neat smooth finish in the areas that are difficult to reach, the Evolution R225DWS is exactly the kind of drywall sander that you ought to look out for. 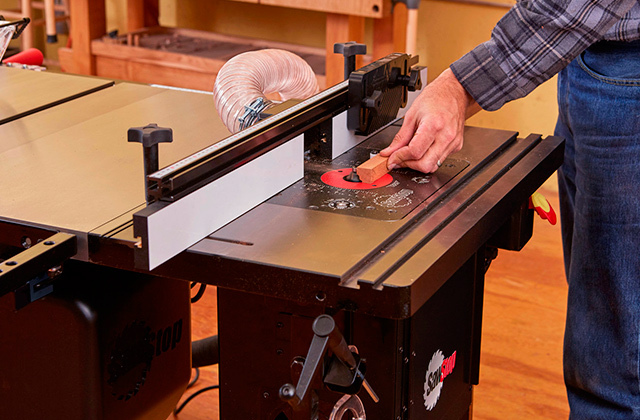 The device stands out thanks to its distinct combination of rotary and orbital actions that ensure an ideal and scratch-free quality sanding on a large variety of woods and metals. Additionally, it is also suitable for sanding down paintwork. Not to mention that, with the appropriate Velcro-backed polishing pads, you will be able to even polish your car with this random orbit sander. The model tends to overheat after hours of continuous work. 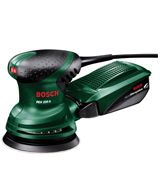 Even without mentioning the ergonomic design of this model, it would seem quite evident that the Bosch PEX 220 is one of the most outstanding and unique models on the market and will be an absolute bargain for anyone interested in an efficient yet unorthodox random orbit sander. The standard removable tips that come included in the package will allow you to attach other, more profile tips, thus greatly increasing the versatility aspect of this product. Furthermore, the included detail finger attachment will provide you with the opportunity to access even the tightest areas. The sandpaper surface is somewhat small. 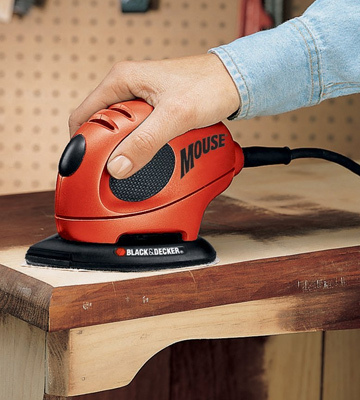 If you're interested in a mouse detail sander that boasts great versatility, is incredibly compact and lightweight, and will allow you to operate it straight out of the box, you simply can't go wrong with the Black & Decker KA161BC. To those individuals that are new to the world of power tools, housing appliances, and the general so-called Do It Yourself experience, the name Makita probably isn't going to ring any bells. And they aren't necessarily to blame for that since the company is relatively unknown outside of this rather specific section of home appliances. But to those people that know a thing or two about drilling, sanding, mounting, screwing, and fixing, the name Makita is as familiar as Samsung is to the world of electronics or McDonalds in the field of fast foods. Makita Corporation has been established over a hundred years ago in 1915 and has been one of the biggest manufacturers of power tools ever since then. So if you're looking for an electric sander, we would be absolutely remiss not to mention the Makita 9404/2, a 240V belt sander. Although evidently not the cheapest option on the market, this is the kind of model that will be able to satisfy any customer thanks to the fact that the designers and manufacturers of this product decided not to cut any corners and did not sacrifice virtually any important aspect in favour of the other one. While we do have to start with at least one of the aspects that make this model stand out from the crowd of competition, picking one of them certainly couldn't be described as an easy task since this device seemingly excels at everything it does. First of all, the fact that the Makita 9404/2 240V Belt Sander produces no more than 84dB of sound while utilising every bit of its power makes this model the quietest sander in its class. And speaking of power, an 8.8 AMP high torque 1,010W motor of this sander will be able to deliver the kind of powerful performance that very few competitors will be able to match. Although what we have on our hands is clearly a powerful and quiet device, one of the biggest selling points of this model, without a doubt, would have to be its versatility. 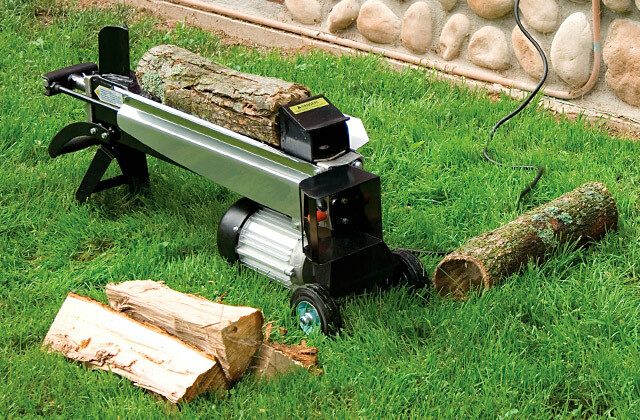 Even though the device in question is a belt sander, this heavy duty and intelligently designed product will be absolutely perfect for giving extremely smooth results. On top of that, the aforementioned unique design will provide you with an ability to flush sanding to the corner of the wall with a nose and the side of your sander. Though mainly used for working with the grain, the device does an exceptional job working across the grain to flatten it before working with the grain to leave a clean, even finish. On top of that, the model is also equipped with a Speed Adjusting Dial that comes in handy when it comes to getting optimum belt speed to suit various workpieces and an auto-tracking belt system that tracks the belt without having to manually adjust it yourself. 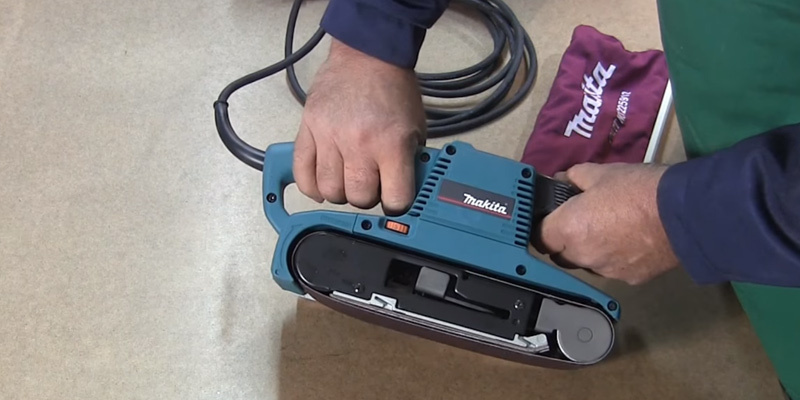 Although this device is far from being the cheapest option on the market, the Makita 9404/2 240V Belt Sander is well worth its price, given that what we have on our hands is probably the most versatile model that is equipped with the kind of power and utility that can handle any type of surface quickly and efficiently. We might not go as far as to call it the best electric sander but it's certainly one of the better contenders for that number one spot. 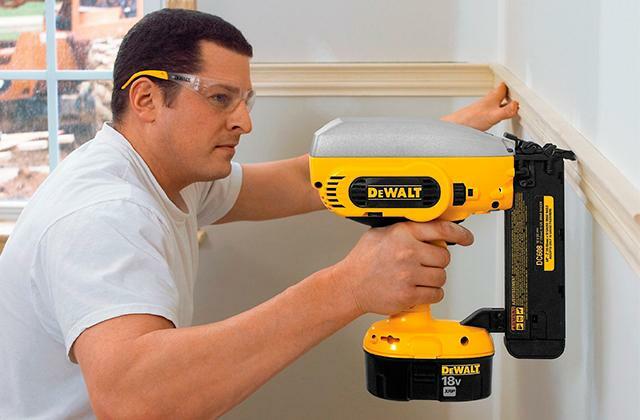 DeWALT is another one of those companies that need no introduction when it comes to the world of power tools and hand tools for the construction, manufacturing and woodworking industries. This American worldwide brand has been in business for almost 100 years now and has managed to make a name for themselves over the past century as one of the most dependable and reliable manufacturers of power tools not just in North America and Europe but across the entire world. 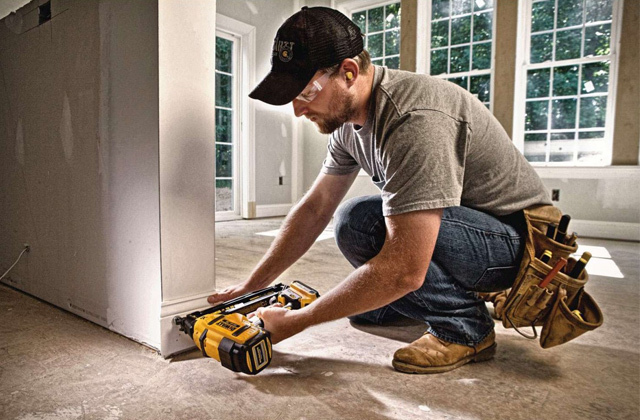 Whether you're a professional that needs a sander for his job or you're simply an enthusiast that could use one of these devices, you know that you can always rely on DeWALT. And, naturally, the DeWALT D26410 is no exception to that rule. Since the model in question is a random orbital sander, you certainly can't expect it to have a motor as powerful as some of the belt sanders tend to feature. However, in order to be able to reach the kind of speed that would fit a premium class model such as this one, a subpar motor simply won't do which is why the manufacturers equipped this product with the 400-Watts one making it, in turn, one of the most powerful random electric orbital sanders on the market. With this kind of motor under its hood, the device is capable of reaching a rotation speed from 4000 to 10000 rotations per minute and 8000-20000 orbits per minute. Since what we have on our hands is a random orbital sander, it comes as no surprise that the device is capable of delivering fine finishes on larger flat surfaces thanks to the 3 mm orbit. But on top of that, you're also getting a 6 mm orbit that will be an absolute lifesaver for fast material removal. On top of that, you're getting variable speed options for heat-sensitive sanding, polishing, and superior finishing. Sending can often prove to be an arduous task given the kind of delicacy and accuracy it requires in order not to damage the surface. Well, with the DeWALT D26410, this whole issue is going to become virtually nonexistent thanks to the help of the controlled finishing system that eliminates the start-up scratching by keeping the sanding pad at a controlled speed. And since this device utilises both hook and loop paper, the changing process is about to become a whole lot faster. By having an integral dust collection, this orbital sander is capable of producing a much safer working environment, not to mention the fact that it helps to extend the sandpaper life. Another advantage of this model that we have to mention would certainly have to be the structure of this product. Designed as a pistol grip type of sander, it fits the hand perfectly and thus is incredibly comfortable and easy to operate. Weighing no more than 2.7 kilograms and featuring 200 mm in height and 129 mm in length, the device is incredibly convenient and won't stand in the way regardless of the type of surface you're dealing with. 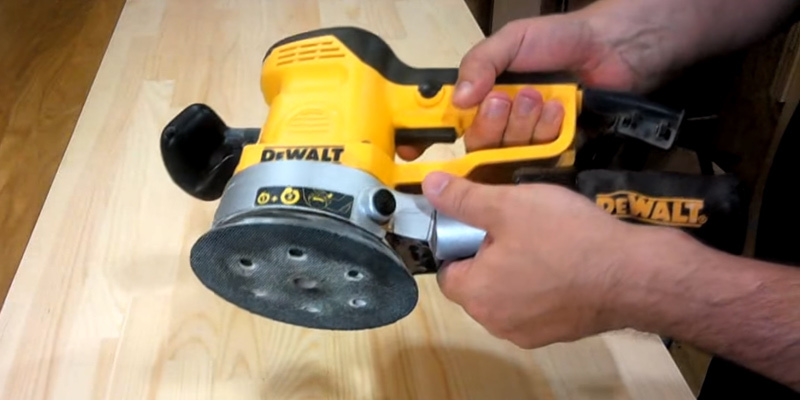 All in all, if you're looking for a random orbital sander that fits your hand perfectly and is capable of delivering fine finishes as well as dealing with fast material removal, the DeWALT D26410 should prove to be a perfect addition to your power tool collection. Whether you're experienced in the field of Do It Yourself kind of applications or even if you have done your fair share of sanding jobs, from time to time you will inevitably encounter the kind of surface that the conventional means and a regular electric hand sander simply won't be able to handle. If you've stumbled upon a particularly difficult wall yourself or just looking to prevent this kind of situation from happening in the future, you should definitely look towards the Evolution R225DWS, an exceptional drywall sander that will allow you to sand from virtually any position. With this device in your hands, no seemingly difficult corner is going to be able to present any kind of challenge to you. 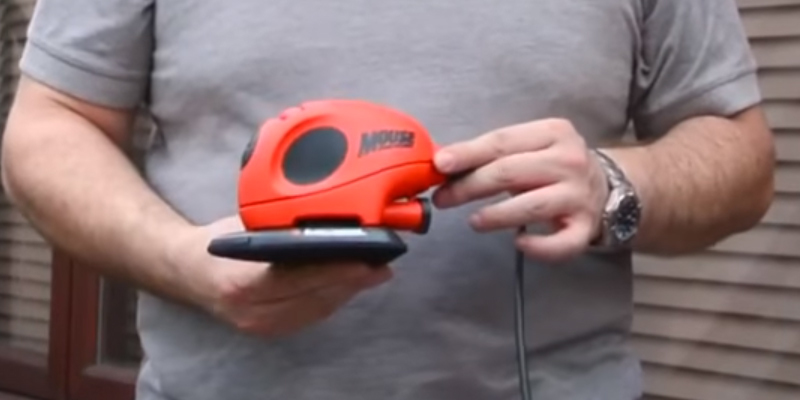 The first thing we would like to mention about this electric sander for walls would certainly have to be a fairly unique structure of this device. Even though the model weighs about 6 kilograms, which may seem excessive if you're talking about a pistol grip sander, this is a fairly acceptable number for a drywall sander. What's more interesting is that the telescopic design of this model provides you with the opportunity to extend it to almost 2 metres in length and that will absolutely come in handy when you're going to try to sand those hard-to-reach areas with an acceptable level of comfort. But that's not all this device boats in terms of comfortable and flexible operation. 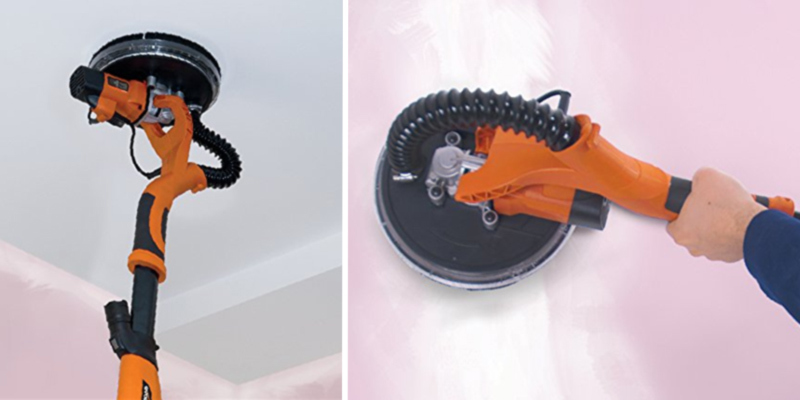 With this model, you're also getting a 0 - 90˚ pivoting head that will ensure the ability to follow the contours of any work surface, even if your wall is rugged and uneven. Now, of course, we would have to talk about the motor of this device since it is every sander's bread and butter and this drywall sander is no exception to that rule. 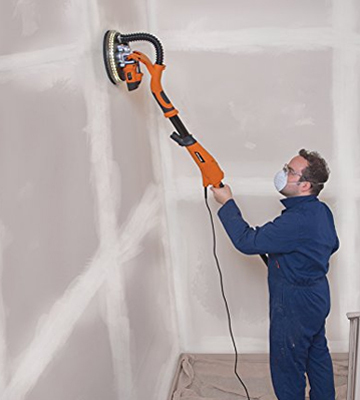 Equipped with a powerful 710W motor, this device is capable of sanding with variable speeds, reaching a maximum amount of 1500 rotations per minute, which is up to 10 times faster than your regular and conventional approach. 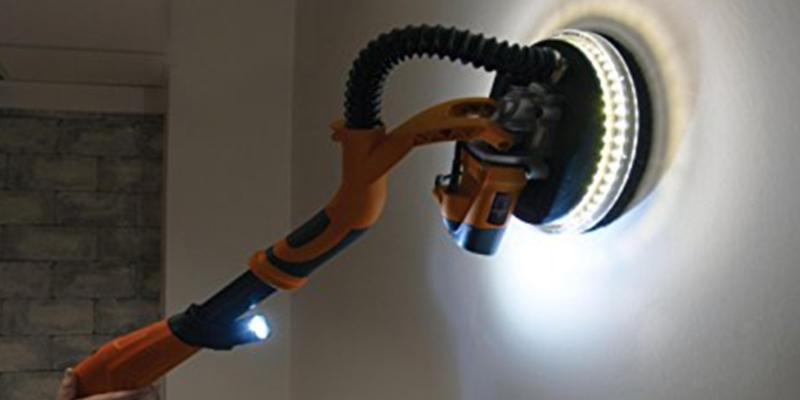 Whether you are looking to sand joints in plaster walls and ceilings or remove old finishes from your surface, this product will be able to do that better than virtually any other drywall sander on the market. And to go back to the design aspect of this model, we would be remiss not to mention the fact that this drywall electric sander comes equipped with soft grips on the main handle and a bail handle that will be absolutely indispensable when it comes to effective control and perfect weight balance. Furthermore, you also receive LED lighting around the entire pivoting head. This kind of design will provide you with the opportunity to see any shadows created by unsmooth areas even when the main lighting source proves to be insufficient. And if that's not enough, the package also includes six mountable sanding discs that come in a variety of different grades to suit any application. Along with the sanding discs, you receive a 4-m hose that is adjusted to the end of the pole and will be able to fit the absolute majority of vacuum ports. To sum it up, if the walls that you generally deal with tend to be uneven, rough, or bumpy, and you often struggle trying to deliver a neat smooth finish in the areas that are difficult to reach, the Evolution R225DWS is exactly the kind of drywall sander that you ought to look out for. There are certain companies that have managed to make a name for themselves in the world of power tools and even in a division as specific as sanders. And then, there's Bosch, a company that needs no introduction when it comes not just to the field of power tools and home appliances but also to electronics and engineering devices in general. One of the keys to the company's success is the fact that, even though they tackle so many different operations, they always make sure to hire the right people for the job. So even though Bosch themselves aren't necessarily experts in the field of electric sanders, you can rest assured knowing that the Bosch PEX 220 was designed and manufactured by professionals that know the ins and outs of this subject in general and the industry in particular. 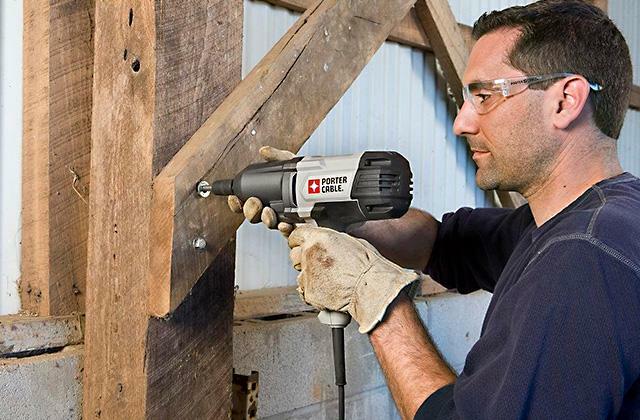 One of the things that make this model from Bosch stand out from the crowd of competition and the secret to the product's commercial success is its distinct combination of rotary and orbital actions. What this kind of approach does is ensure an ideal and scratch-free quality sanding on a large variety of woods and metals. Additionally, this kind of structure also makes the device suitable for sanding down paintwork. Moreover, with the appropriate Velcro-backed polishing pads, you will be able to even polish your car with this random orbit sander. There are two simple but major differences between the Bosch PEX 220 and a regular orbit sander. First of all, the base (also known as the head) of this device is round and not rectangular which is exactly the reason why the model is capable of tackling polishing jobs. Second, the sanding process itself substantially differs from the one that your standard orbital sander provides. 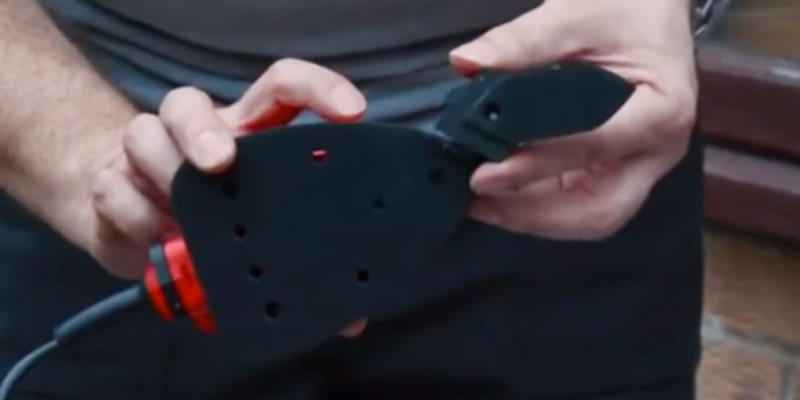 This difference manifests itself in a few ways, the biggest one of which is the fact that the sanding discs themselves are attached using a Velcro type of system. The biggest advantage of this structure is that these discs are easy to fit and remove. They're also pre-punched with holes thus allowing the dust extraction system to work as efficiently as possible without becoming a liability. On top of that, the sanding pad works in an orbital and rotary movement at the same time. With this type of approach, what you receive is up to five times faster material removal compared to a regular orbital sander and the finish is completely scratch-free which is more than suitable for when the wood is to be varnished or stained. We would also like to mention a few other things that cement this model as one of the most extraordinary random orbit sanders on the market. The manufacturers refer to the first one as a Sanding Sheet Clamping System that comes equipped with Velcro-type Fastening. The biggest advantage of this system is an extra-large sanding surface (125 mm) comprised of the high-quality magnesium sanding plate and a powerful 220W motor, both of which ensure fast sanding on large areas. Furthermore, the device comes with an integrated Microfilter System that conveys up to 80% of the dust at high speed directly through the sanding sheet and sanding pad into the transparent, ribbed filter. The box can be emptied quickly and easily, so it can be used continuously which results in the clean workplace, clean air, clean results, even without having to use a vacuum cleaner. 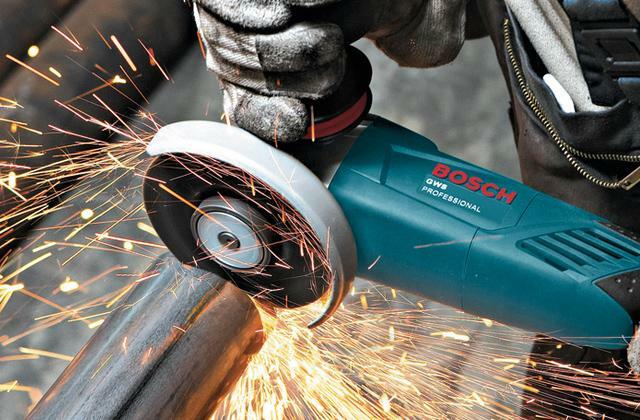 All in all, without even mentioning the ergonomic design that makes this device perfectly suitable for one-hand operation, it would seem quite evident that the Bosch PEX 220 is one of the most outstanding and unique models on the market and will be an absolute bargain for anyone interested in an efficient yet unorthodox random orbit sander. 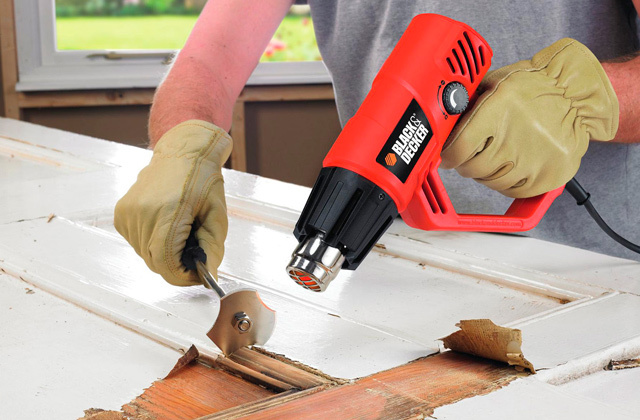 Even if you're an expert in the field of sanding and power tools or a professional woodworker with years of experience under your belt, there's a good chance you haven't heard of the Black & Decker company. And while that is completely understandable since the name itself is relatively unknown, you might be surprised to learn that these are actually the people behind DeWALT, which is simply a trade name of Black & Decker. So if you stumble upon, say, the Black & Decker KA161BC, which is a quality mouse detail sander that comes with every necessary accessory included in the package, and you feel like you aren't sure whether this is the company to put your trust in, rest assured knowing that these are the people behind one of the oldest and most respected companies in the Western world. To start with, we would certainly have to address the proverbial elephant in the room, which is the size and the design of this model. Since even by mouse detail sander's standards, this device seems minuscule, to say the least, featuring less than a kilogram of weight (889 g, to be precise) and 25 x 10 x 16 centimetres of overall dimensions. With this kind of size, you might arrive at the conclusion that the model doesn't pack sufficient enough of a punch. Well, you would be wrong, since the product comes equipped with a fairly capable 55W motor, which is more than you should expect out of a mouse detail sander. It probably goes without saying that this compact of a design will allow you to work closer to the surface, thus acquiring greater control of the sanding process. The detail base itself is designed in a way that would provide you with better results when working with intricate areas since the teardrop shaped base allows you to access even the tightest corners easily and effortlessly. Furthermore, the process of changing the sanding paper has never been simpler or more convenient thanks to the quick fit ‘hook and loop’ solution. On top of that, the rotatable base provides you with the opportunity to rotate paper as it wears thus prolonging the life of the sanding paper. But just because the model in question is compact and lightweight, you should definitely avoid presuming that it will be able to deal with only a handful of applications. Even though it is undeniably small, this device is capable of tackling some of the hardest tasks out there, including but not limited to paint and varnish removal, rust removal, detail sanding, metal and plastic polishing, and glass cleaning. The standard removable tips that come included in the package will allow you to attach other, more profile tips, thus greatly increasing the versatility aspect of this product. Furthermore, the included detail finger attachment will provide you with the opportunity to access even the tightest areas. And speaking of the things that are included in the package, this sander comes with a set of every necessary accessory in the box so that you can start working on your project right away. The aforementioned box includes a polishing pad, a rust removal pad, three different types of sanding sheets, a finger attachment, and a finger sanding sheet. 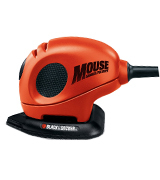 So if you're looking for a mouse detail sander that boasts great versatility, is incredibly compact and lightweight and will allow you to operate it straight out of the box, you simply can't go wrong with the Black & Decker KA161BC. 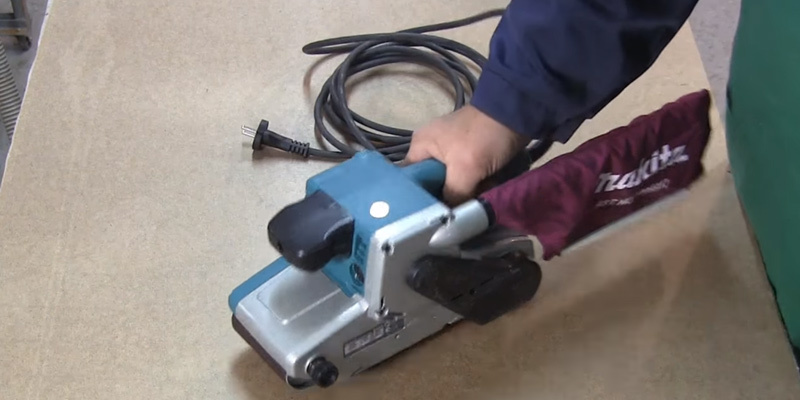 What Is an Electric Sander? Those who’ve ever done repairs or made anything of wood faced such tasks as grinding or sanding. This process might not be to your liking, for it requires care, it's pretty monotonous and time-consuming. Previously, high-quality sanding took a lot of time and anyone engaged in the sanding work might have thought much about speeding the process up. Fortunately, responding to the user needs, there are many sander and grinder machines, designed for any occasions and tasks and serving both professionals and home craftsmen. 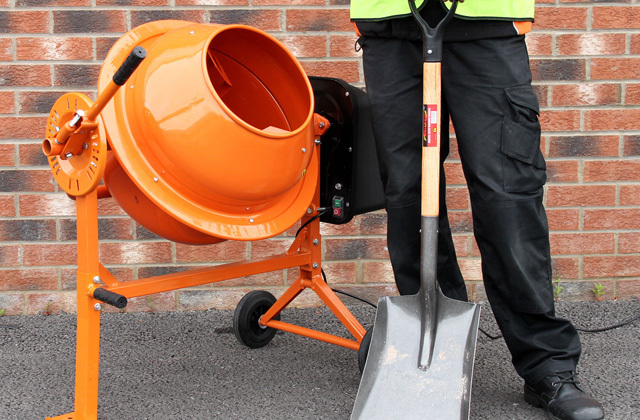 To make sure the result will fit your ideas, it’s important to check a variety of sanders and to know well what jobs you will use it for. For this review, we've hand-picked 5 best electric sanders available out other in hope to make it easier for you to find the right tool. 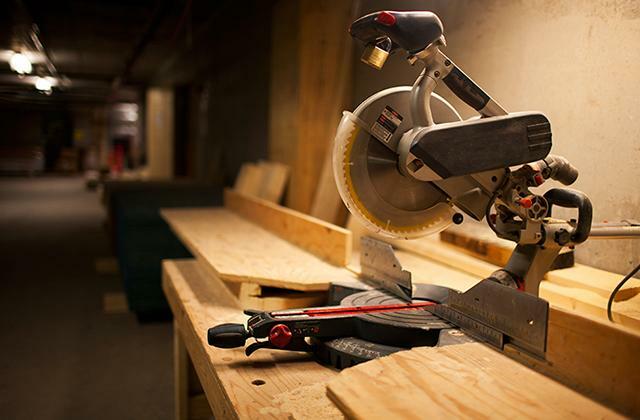 For completing jobs related to carpentry and wooden furniture making, please, consider buying a jig saw designed for figural wood cutting and a circular saw that is best suited for cutting wood boards. To choose the right sander, think first about what you’re going to use the tool for. Depending on the task, you’ll need to use the sander of the right Type — an orbital sander, a random orbit sander, a disc sander, a belt sander, a detail sander, you can also choose between a hand sander and a stationary sander machine, a power sander and a simple manual one — the variety of types and applications is immense! Each sander is primarily designed for specific tasks. For example, orbital sander tools are perfect for the finish sanding of large flat surfaces. If you’re seeking for a hardwood floor sander, a wall sander (or maybe both) that will provide you with a neat smooth finish, pay attention to this type of sanders. A belt sander is great for quick rough sanding, the high speed of the belt makes it easy to quickly remove a coat, smoothen or curve the workpiece, remove old paint or rust. However, due to the high speed, there might be chips and scratches on the treated material, which requires further sanding with a more delicate sander polisher. A random orbit sander is a universal sanding tool, it easily copes with the finishing sanding, and if necessary you can use a coarse abrasive to remove old coating or paint, remove bumps or round out the edges. 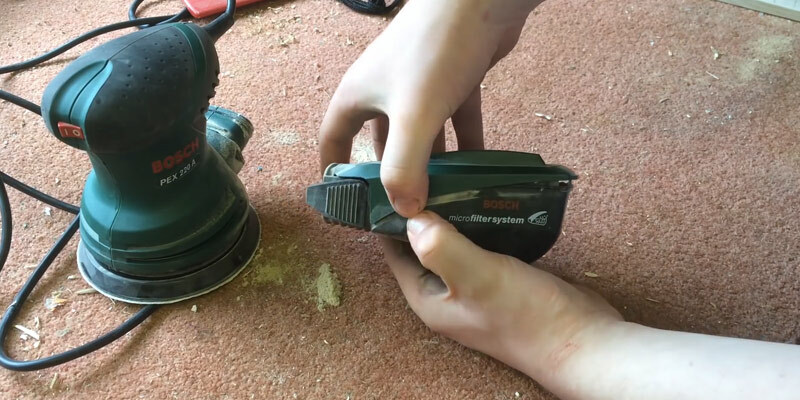 The only thing this sander cannot handle is inner corners where its round sole pad won’t get. 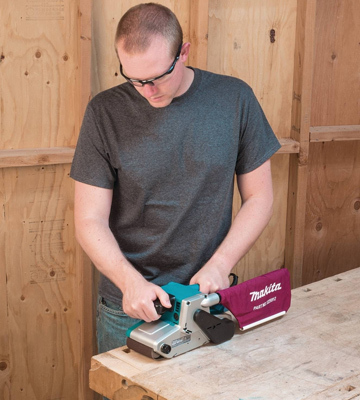 A detail sander tool does excellent job finishing corners and other hard-to-reach places. The design of the sole makes it easy to handle furniture and complex shapes. Stationary desktop sanders are well-suited for the treatment and precise shaping of small wooden, metal, plastic, ceramic or composite details. If you’re into professional sanding, make sure to have all the types of sander tools at your disposal. The Performance of a sander determines the time you spend on sanding and the amount of work. There are several factors affecting the performance. The power and the motion speed of the abrasive surface are common parameters for all the sander types. The power determines the efficiency of the sander motor and the load it can withstand. The time spent on sanding and the quality of sanding. The higher the speed, the faster the sanding, yet the quality decreases. Low sanding speed provides for better quality, but it takes more time to complete the sanding. The speed of a belt sander is usually measured in surface feet per minute (SFM), the operating speed of other sanders is usually measured in orbits per minute (OPM). Another parameter important for any detail, orbital or random orbital sander is the orbit diameter of its pad circular movement. The smaller the sander orbit diameter, the smaller the treated area, but the better the sanding. The adjustable speed will allow picking the optimal parameters for different materials. The size of the sander working surface determines the sanding speed, but the small size will allow you to handle fine details more easily. Comfortable use of the sander increases productivity and reduces fatigue. That’s why the Convenience of the tool is a very important parameter when choosing the right sander. Be sure to consider the type of the abrasive material and the way it’s attached to the sander. Although most sander tools use specific abrasives with adhesive backing, a number of sanders allow using universal sandpaper fastened with clamps. Make sure that the sander you choose has a dust collector and that you can attach to a vacuum tool. 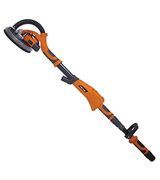 The rubberized grip lets you keep a firm hold on the sander during operation. Extra accessories can facilitate sanding, while a carrying bag or a case will provide convenient transportation or storage of the sander and accessories. Sanding Isn't as Glamorous as One Might Think. Even if you were to survey thousands of people that are either professionally engaged in this particular field or simply prefer to utilise power tools in order to do some certain kinds of job around the house what their favorite DIY activity is, the chances that a major part of them is going to mention sanding wood are virtually nonexistent. And if you have ever done it yourself, there's a good chance you won't be surprised by this fact. 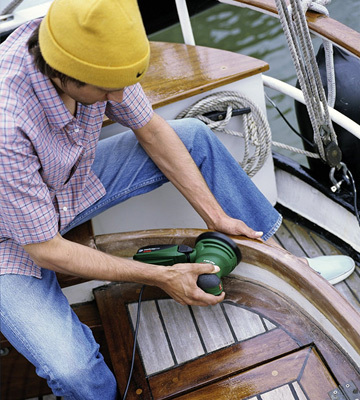 Sanding is really no more popular than scraping paint or doing your own dental work. However, if you're an active do-it-yourself kind of person, sanding wood is virtually unavoidable. And the only way to make this exhausting and often tedious task a little more pleasant is to employ the services of an electric sander since they are the best, quickest, and easiest way to sand wood smooth. Now, since there are quite a few different sizes and types of sanders available on the market, we're not going to go into details on each one of them but simply provide you with some general instructions that will come in handy for anyone using an electric sander for the first time. In order to use a sander, all you really need to know is, first and foremost, how to attach the sandpaper to the sander. In order to do that, you will first have to locate the metal (sometimes a different material is used but, generally speaking, it is almost always metal) locks on the sides of the sander. Now, you ought to pull down and out on each of the locks. You're doing that in order to release the end clasps that will hold the sandpaper in its place. After you're done with that, you should take a sheet of sandpaper and tear it into four smaller parts. Now, take one of those fourths and place it on the bottom pad of the sander. Once you're done doing that, the next step is to tuck the sandpaper under each end clasp and lock each and every one of them down. After that, you should press the electric sander's power button, which is usually located at the top of your model. All that is left to do is to plug the device in, flip the switch and you are ready to sand. It Really isn't That Dangerous. One thing we would like to mention is that while your electric sander is operating, the sandpaper tends to move around quite rapidly. There's a chance you might think that if your hand touched the sandpaper it would result in mountains of pain. However, you would be pleasantly surprised to know that no harm will come to you if your hand or anyone else’s hand, for that matter, comes into contact with the paper while the electric sander is on. 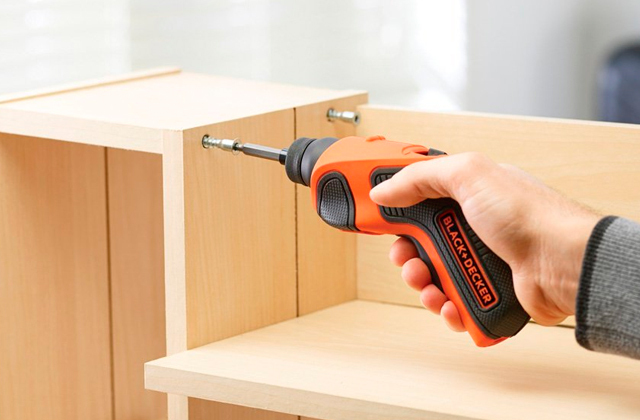 Meaning that, while you shouldn't disregard some general rules of conduct when it comes to any power tool, this one is one of the safest devices of the whole family and you can use it freely without having to worry about hurting yourself or anyone around you. Q: How many types of electric sanders are there? A: There are quite a few different types of electric sanders for wood and naming all of them would certainly take some time. But the list of the most popular ones includes but isn't limited to flap sanders, belt sanders, disc sanders, oscillating spindle sanders, random orbital sanders, detail sanders (which include mouse and corner sanders), orbital sanders, straight-line sanders, stroke sanders, drum sanders, wide-belt sanders, and profile sanders. And if you find this list all too confusing, there's no need to worry. Unless you're a professional looking for a very specific application, a belt sander, an orbital finishing sander, and a random orbit sander will do the job for you. 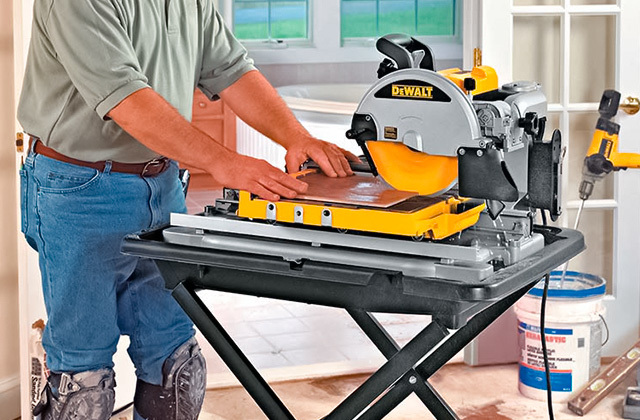 Q: Why should I get a belt sander? A: If you're looking for a type of product that would be able to smooth large, flat surfaces, especially some of the really rough ones, there isn't really any kind of model that will be able to beat the high speed and brute strength of a belt sander. This heavy piece of power tool equipment utilises sanding belts, which are continuous loops of reinforced abrasive cloth that fit over two cylindrical drums. The device's motor operates the rear drum while the front drum is able to spin around freely. A tension-release lever will provide the user with the opportunity to easily slip the belt onto the drums. In order to keep the belt running the way it is supposed to, the majority of sanders feature a tracking adjustment knob that you can turn to centre the belt. Q: What are the main advantages of an orbital finishing sander? A: There is a number of advantages that make an orbital finishing sander such a popular choice among the majority of DIYers. But if we had to pick a few of them, it would have to be the fact that these models tend to be lightweight, easy to control with just one hand, and also relatively quiet, at least compared to belt sanders and some of the other types of models out there. Not to mention the fact that it is next to impossible to induce any sort of physical damage to the workpiece with this type of sander. 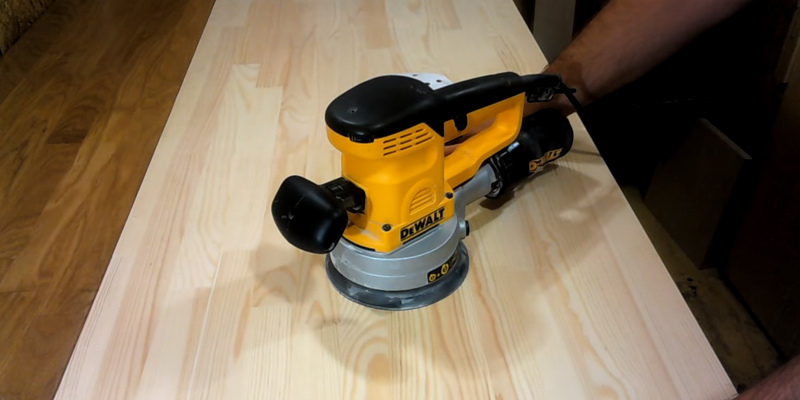 However, since these devices tend to be relatively docile, an orbital sander isn't particularly useful for heavy stock removal and is more intended for ultra-smooth wood sanding, rounding over sharp edges, sanding off hardened wood putty, and knocking down dried coats of paint or varnish. Q: What is a random orbit sander? 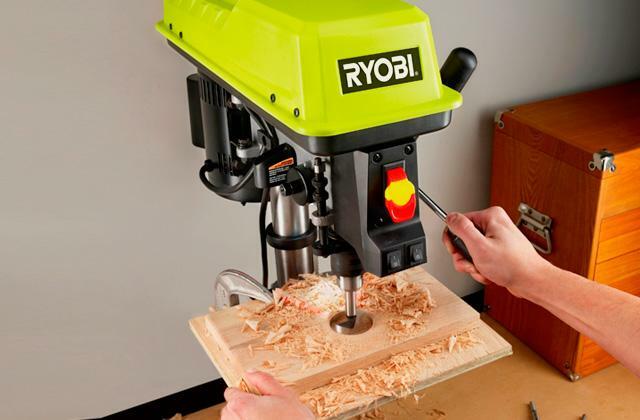 A: A random orbit sander is the kind of model that would be best described as something falling somewhere in between a belt sander and an orbital finishing sander. It can be quite easy to confuse a random-orbit sander with an orbital sander: not just because two of these names sound relatively similar but also because the tools share a common design, which generally manifests itself in a compact housing with rounded palm-grip tops. However, there's at least one small yet rather crucial difference between these two types of sanders: an orbital sander features a square sanding pad, while a random-orbit sander includes a round pad. 1. Joseph Truini Know Your Power Sanders, And How to Use Them, Popular Mechanics. October 2, 2012. 2. Selecting the Right Power Sander for the Job, DoItYourself. 3. Kit Stansley Choose The Right Sander for Your Project, LifeHacker. May 9, 2014. 4. 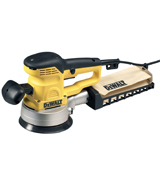 Essential DIY Tools — Electric Sander, Addicted 2 Decorating. March 21, 2013. 5. DIY Basics: Essential Guide To Sanders, Handyman. 6. Sander, Wikipedia. April 9, 2016. 7. Lee Wallender 5 Types of Sanders For Your Remodel Project, The Spruce. January 24, 2017. 8. How to buy a sander, Which? 9. Hand and Power Tools, OSHA.